Made of rotationally molded linear density polyethylene material. Comes with convenient built-in carrying handle, hook and loop fasteners that keep the towel in place and a sturdy metal pull strap fastener. 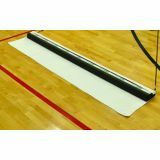 Courtclean Towel, 6'. 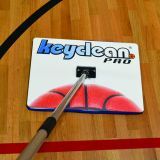 Use with Courtclean floor cleaning system. Protect your gym during nonathletic events with ultra durable 3-ply fabric. Flame-retardant, antibacterial, antifungal and rot/mildew resistant. Constructed in 10'W sections for easy handling. Meets California Fire Marshall Spec. Floor covering: specify dimensions needed. We suggest adding 6"-12" for overlapping each section. 5' wide minimum charge. Call for freight quote.18 oz fabric. 5 year warranty. Protect your gym during nonathletic events with ultra durable 3-ply fabric. Flame-retardant, antibacterial, antifungal and rot/mildew resistant. Constructed in 10'W sections for easy handling. Meets California Fire Marshall Spec. Floor covering: specify dimensions needed. We suggest adding 6"-12" for overlapping each section. 5' wide minimum charge. Call for freight quote. 22 oz fabric. 7 year warranty. 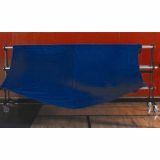 Protect your gym during nonathletic events with ultra durable 3-ply fabric. Flame-retardant, antibacterial, antifungal and rot/mildew resistant. Constructed in 10'W sections for easy handling. Meets California Fire Marshall Spec. Floor covering: specify dimensions needed. We suggest adding 6"-12" for overlapping each section. 5' wide minimum charge. Call for freight quote. 27 oz fabric. 8 year warranty. 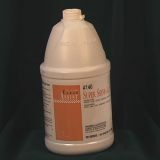 Fast drying, slip resistant to reduce injuries and reduce refinishing frequency. 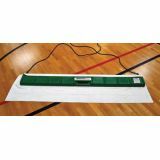 Two large 18" x 24" mops made with highly absorbent microfiber pads, attaches to a 6' adjustable two-piece aluminum handle. Includes 3 mops and 2 pads. Storage racks are made with all steel construction and 8" diameter non-marking wheels that lock and swivel. Includes two hand cranks.